Audio for the music lover - An active current-drive audio systemAn active current-drive audio system | Crystal clear sound, precise and stable soundstage and a smooth adjustable in-room response. Crystal clear sound, precise and stable soundstage and a smooth adjustable in-room response. 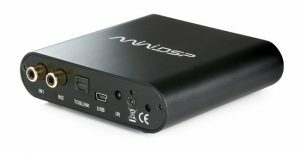 A digital-controlled, active, current-drive audio system. A smooth adjustable in-room response, with a deep punchy bass. The only components are the Scan-Speak drivers. No ports, no passive filters, no other components at all. No components between driver and amplifier. 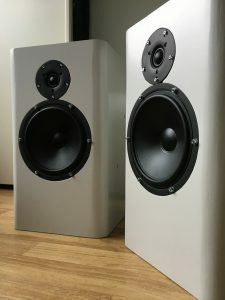 Current-drive for lower loudspeaker distortion. A class AB amplifier per channel, each fitting on a circuit board of 6.3 x 3.4 cm. 0.005 % distortion at 5 Watt continuous power. 0.1 % maximum distortion till 50 Watt continuous power (100 Watt peak power). An ‘old school’ power supply with a big toroidal transformator and big capacitors. You can control the system with a remote control or with a computer via an USB connection. It is a system for music lovers. There are little options for hardware tweaking, you cannot exchange components, because it is an integrated system with the components working close together. But you can directly manipulate the in-room response, the outcome of all the hardware tweaking in other systems. CD player on analog input. TV set on optical input. AppleTV connected to TV set (Audio, video and Ethernet). TV set for (wireless, via AppleTV) DLNA and Dolby/DTS decoding. AppleTV for Airplay and Dolby decoding. Both as player (active, pulled media) and as renderer (passive, pushed media).